Strong evidence exists that the equine influenza virus can occasionally infect humans, according to scientists, who suggest closer surveillance for novel flu viruses among horses is warranted. “The historical, observational, and experimental data are compelling in supporting the premise that equine influenza virus infections occasionally occur in man,” Tai Xie and his colleagues reported in a scientific review. “While in recent years, human infections with equine influenza viruses have not often been associated with signs of infection, the propensity for influenza A viruses to change makes these viruses worthy of our attention,” they said. The singled out the H7N7 strain, last isolated in horses in the late 1970s, as a particular risk. “Should H7N7 equine influenza virus strains again emerge, most humans would have little cross-reacting antibody, and the threat to humans might be quite different than that commonly seen today for H3N8. 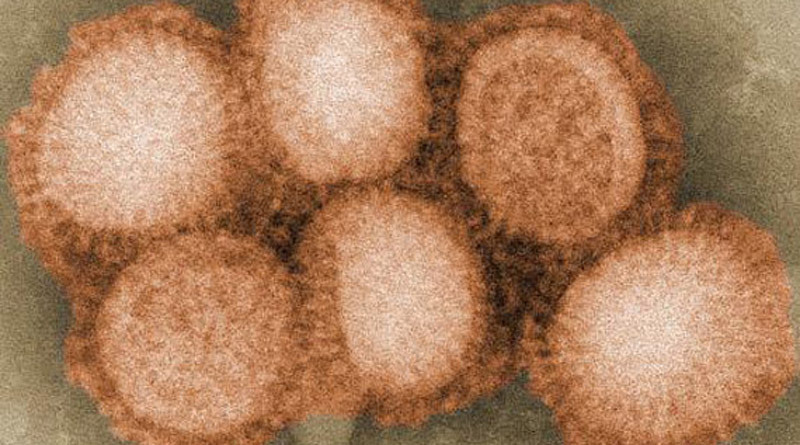 The scientists, writing in the peer-reviewed journal Pathogens, noted that there were mixed opinions among scientists over whether the equine influenza virus can infect humans. The review team set out to examine evidence that equine flu viruses were zoonotic – that is, capable of being spread between animals and humans. They carried out what they described as a systematic and comprehensive review of relevant English, Chinese, and Mongolian scientific literature. In all, 16 scientific articles met their inclusion criteria for their review. There was, they said, considerable experimental and observational evidence that at least H3N8 equine influenza viruses have occasionally infected people. A Boston fire wagon without its horses during the great epizootic of 1872. Influenza A virus-like-illnesses have been recognized in horses since at least 1299. A particularly well-documented influenza-like epizootic occurred among US horses during 1872, causing widespread damage to transportation and commerce. Researchers have suggested it may have originated from birds. However, since the 1930s, only two major subtypes of equine influenza viruses have been detected in ill horses: H7N7 and H3N8. The last H7N7 viruses were isolated in the late 1970s, with only variants of H3N8 viruses causing sporadic outbreaks since then. With the exception of recent H3N8 equine flu variants which have caused outbreaks in dogs, and possibly an infection in a camel, recent equine flu outbreaks have not been associated with spill-over to non-equid species. The review team said they found considerable historical evidence of equine influenza virus infections in man. Other researchers had observed that, from 1658 to the early 20th century, equine influenza virus outbreaks in horses often occurred three weeks or so before human influenza-like-illnesses. “In particular, scholars have implicated the 1889 human pandemic as likely caused by a H3N8 equine influenza virus. Serological studies, published in the 1960s, of people who lived during that 1892 era, are most compelling in documenting elevated antibodies against H3N8 equine influenza virus,” they said. Several healthy human equine influenza virus challenge experiments were conducted in the 1960s, the scientists noted. In 1965, hospitalized volunteers received challenges with live equine H3N8 virus and were monitored for evidence of infection. Each subject had viable virus isolated three days after challenge, but only one subject developed clinical signs – an elevated rectal temperature, mild sore throat, nasal congestion and obstruction, and an increase in the number of white cells in the blood. In 1966, another human volunteer challenge study with H3N8 equine flu virus was conducted in which four of 33 volunteers developed clinical signs. Twenty-one of the volunteers had virus isolated three days after inoculation, and 20 developed a four-fold or greater increases in antibody levels 28 days after inoculation. Another human challenge experiment in 1969, again using equine H3N8 virus, resulted in 13 of 15 volunteers developing signs of illness. Experimental data suggested that the H3N8 virus was not weakened following passage in humans, as it was still capable of infecting and causing illness in horses. The scientists said while there were scattered reports in the news media and historical science writings of horses, dogs, humans, and even cats with influenza-like illnesses, modern documentation of human equine flu virus infection in observational reports was sparse. A traffic alert during the 2007 equine influenza outbreak in Australia. The disease was successfully eradicated from the country. Mongolia, they noted, has the largest horse-to-man population ratio in the world and has often suffered large flu outbreaks among horses. For instance, a 1983-84 H3N8 outbreak affected an estimated 891,000 horses, causing 176,000 deaths. After anecdotal reports suggested children in Mongolia developed respiratory illnesses after exposure to horses with flu infection, members of the review team conducted a prospective study to investigate human infections with equine flu virus. From 2009 to 2011 they enrolled and followed 439 Mongolian adults, many with occupational exposure to horses, for evidence of equine flu virus infection. In all, 100 developed an influenza-like illness and were investigated with molecular and viral culture studies for influenza. Thirty-six cases (36%) were identified as influenza A infections but none had evidence of equine flu virus. However, examination of body fluids upon enrollment, and at 12 and 24 months later, revealed that about 40 participants had detectable microneutralization antibody titers against A/Equine/Mongolia/01/2008(H3N8). However, all such titers were below the level that represented the accepted benchmark for acute infection and evidence was not compelling for recent equine flu virus infection. Soon after, at least 1400 horses were infected with H3N8 equine flu virus during a 2007 outbreak in Australia. Again, the authors conducted a cross-sectional study for equine flu virus infections among 89 people exposed to those sick horses, plus 11 controls. Serum samples were tested for the presence of antibodies against H3N8 equine flu virus. Again, evidence of acute equine flu virus infection was sparse, with only nine study participants having low titers of antibodies which might easily have been associated with cross-reacting antibody from human influenza virus or vaccines. More recently, the authors reported results from their 2005 cross-sectional study of 94 horse-exposed adults and 34 non-exposed controls from three sites in the US state of Iowa. Findings suggested at least a portion of horse-exposed adults had been previously infected with an A/equine/Ohio/2003(H3N8)-like strain. Discussing their findings, the review team said at least three H3N8 equine flu virus human challenge studies clearly documented that human infection was possible and that subjects may not show signs of illness. The 1960s observations also showed that human-passaged viruses showed no evidence of attenuation (weakening). “While the observational studies of human equine flu virus infection in Mongolia and Australia were essentially negative, the 2005 cross-sectional study of horse-exposed adults in Iowa was more compelling as observational evidence for human infection with equine flu virus,” the review team said. They continued: “During our review we became aware that there have been a number of non-equine influenza A viral segments identified in horses. “In searching the Influenza Research Database, we found that genome segments related to influenza A H1N8, H5N1, H7N1 and H9N2 strains have all been detected among samples collected from horses. “Although these identifications seem to be rare, accounting for less than 0.5% of all equine influenza virus detections, it may indicate that horses are at least susceptible to more diverse strains of influenza A virus than previously thought. “For example, in 2011 a novel H9N2 influenza A virus was detected, isolated, and fully sequenced in a study of horses in Guangxi Province, China. “Additionally interesting findings are that equids are not always H3N8 EIV ‘dead-end’ hosts. These findings supported the need for continued surveillance among equids for novel influenza A viruses, they said. However, they cautioned that even with the experimental and observational data supporting evidence that the H3N8 equine flu virus may infect man, the test results in humans may have been confounded by pre-existing antibodies against other influenza strains such as those caused by other human H3 viruses or vaccine. Xie was joined in the review by Benjamin Anderson, Ulziimaa Daramragchaa, Maitsetset Chuluunbaatar and Gregory Gray. They are variously affiliated with the Division of Infectious Diseases and Duke Global Health Institute at Duke University in North Carolina in the United States; the Faculty of Health Service at the Second Military Medical University in Shanghai, China; and the National Center for Zoonotic Diseases in Ulaanbaatar, Mongolia.